Welcome to post 4 of my trip to Baton Rouge. 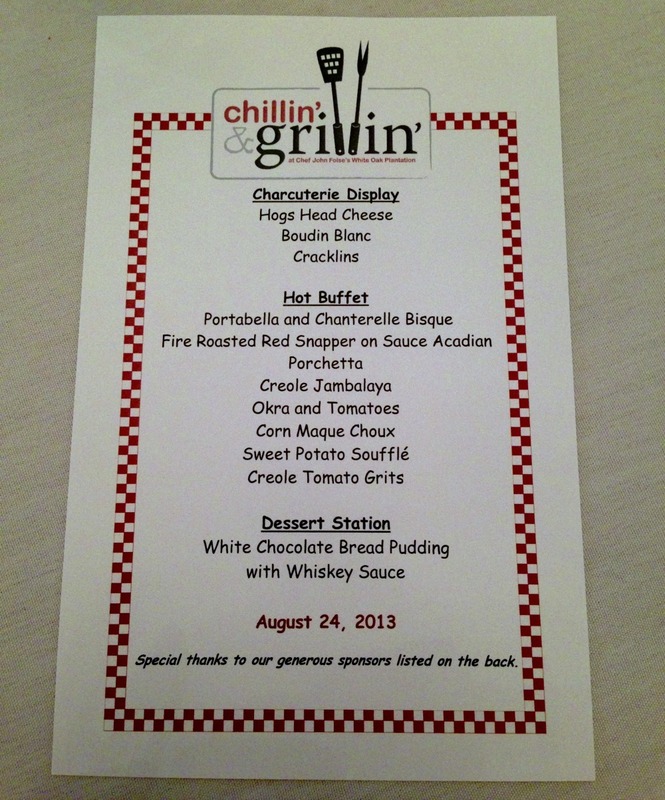 During the evening of our second day we went to the annual Chillin’ and Grillin event held at White Oak Plantation. 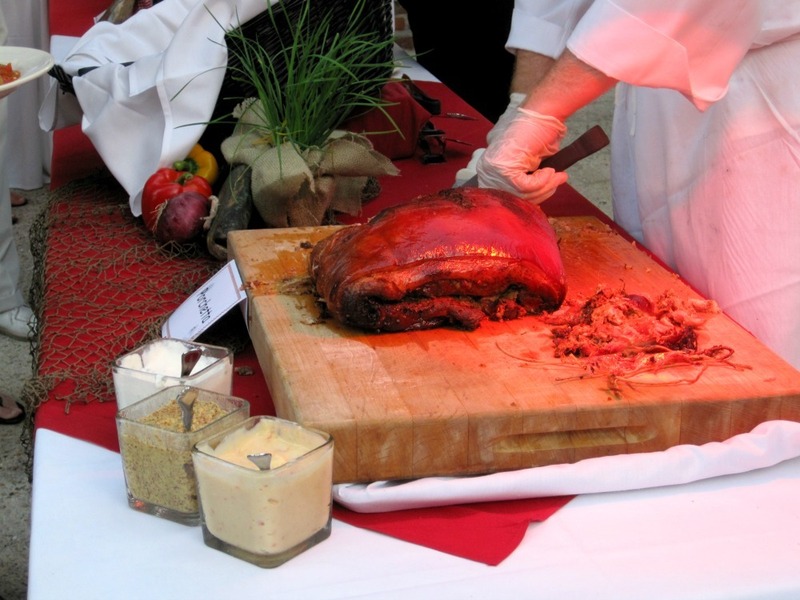 The Chillin’ and Grilin event is a buffet-style dinner where you can meet and greet with chefs and designers participating in Dining by Design. The event is sponsored by Fete Partner The Sister Dulce Foundation, Inc. 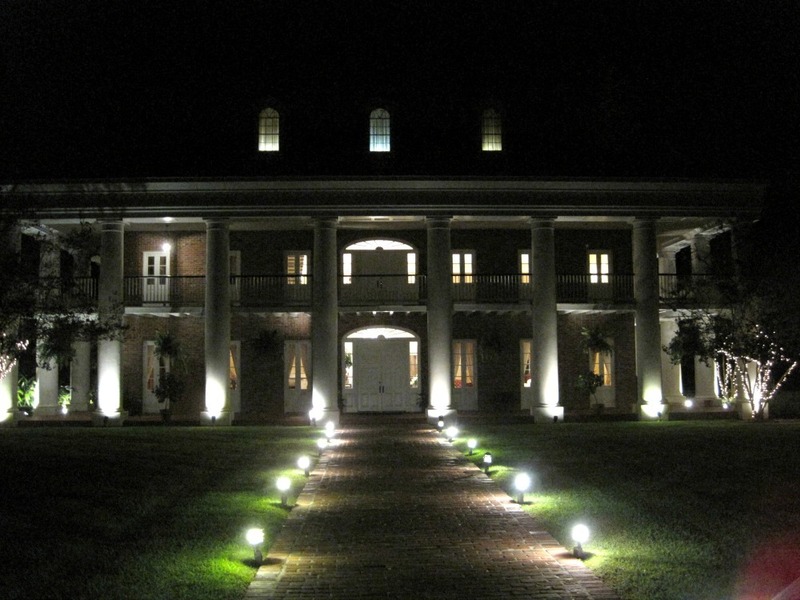 The property at White Oak Plantation is simply beautiful. It has lakes, lush gardens and even a chicken coop. 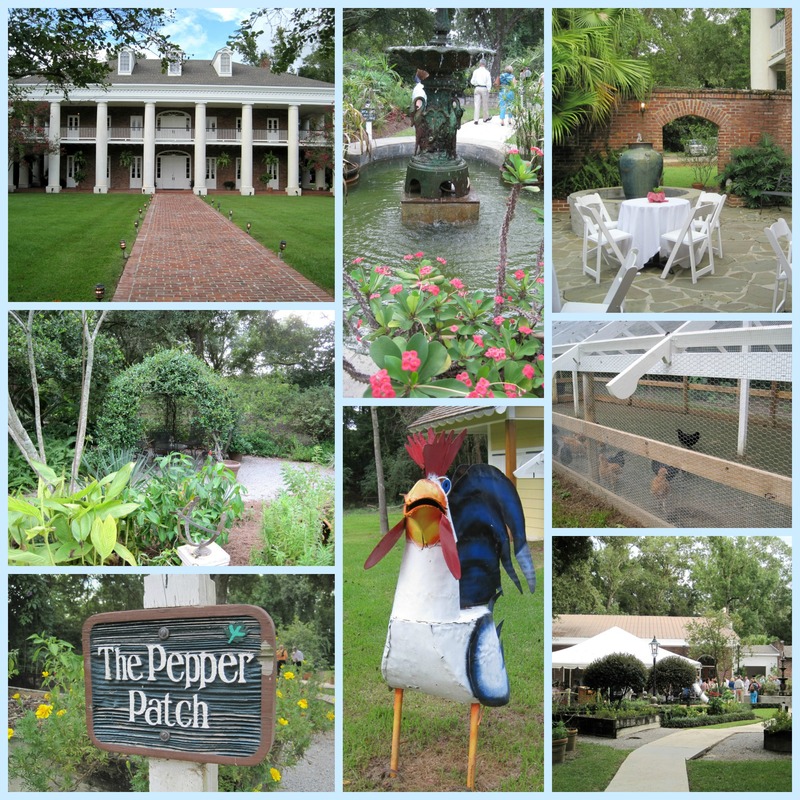 Here is a little collage of the grounds at the White Oak Plantation. Isn’t it beautiful? The White Oak Plantation would be the perfect place to hold a special occasion event like a wedding or maybe to renew your vows? hint, hint Husband! I also met some chefs and I chatted with some wonderful people who worked at the event. The food at Chillin and Grillin was amazing!! But I bet you are not surprised by that! I had for the first time Hog flings and red snapper. The hog flings was good, but I wasn’t a fan of red snapper. I just starting trying out fish and this one wasn’t for me, at least for right now. So what else is on the menu for this evening? Well I just happen to take a picture of the menu for you. Thank goodness for cameras because I left my menu at the plantation. This is a full menu and just wait till you see my dinner plate. But first up on the menu was appetizers. 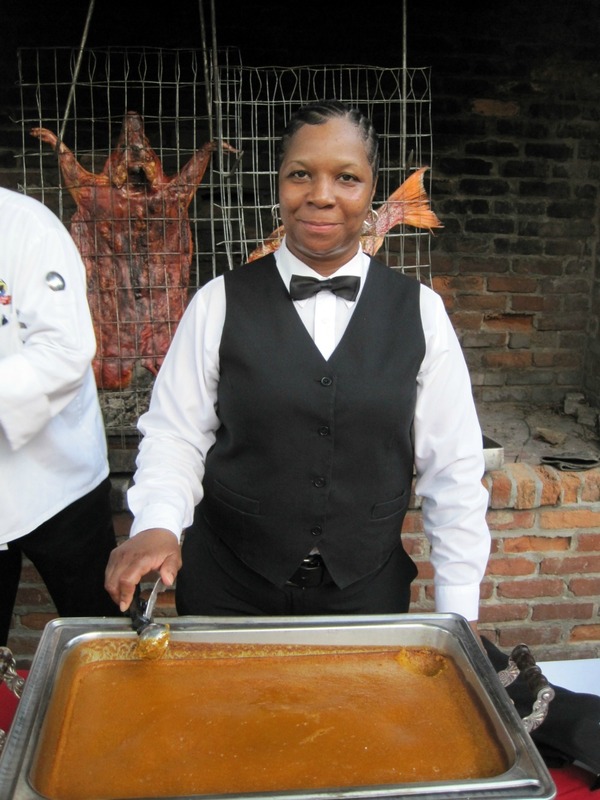 Everyone had a glass of wine in one hand and a plate of Hog Head Cheese, Cracklins and Boudin Blanc in the other. I had a couple glasses of wine, but I skipped on the appetizers. I was saving myself for dinner!! Not to mention this is part two of Tuesday and Wednesday’s post and as you can see at that point I ate a lot. he he So first up on the menu was the Creole Jambalaya. 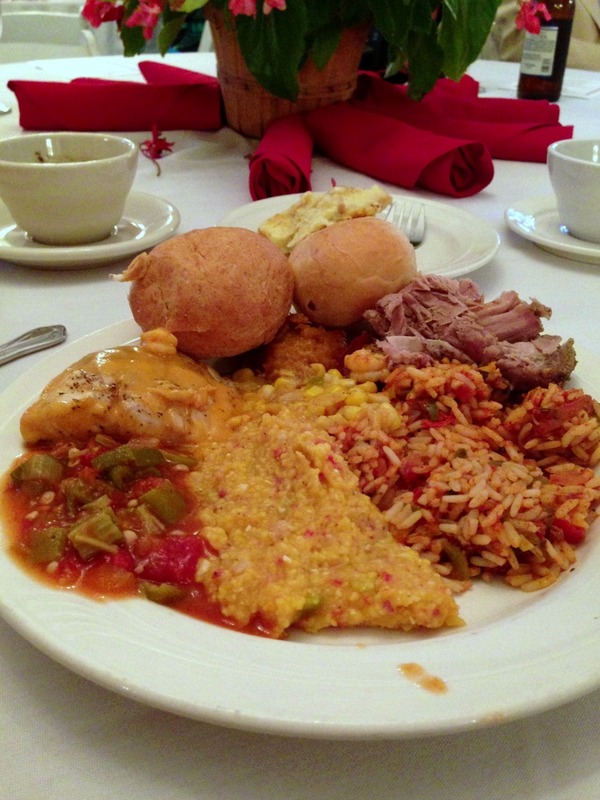 This was fantastic and exactly what I think of when I think of Louisiana food. It was delicious!! 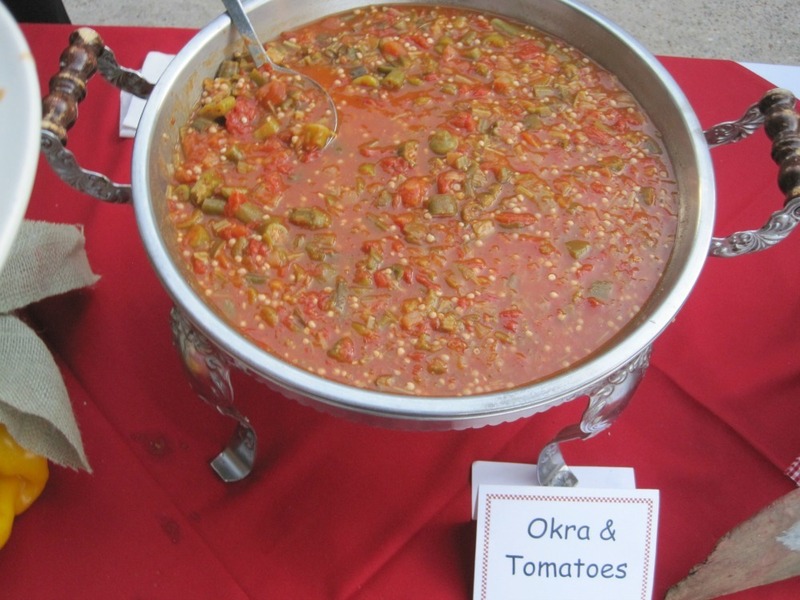 The second thing I had was the Okra and Tomatoes. I loved this dish!! I never had okra before, but now I am going to buy some and try it out at home. I think my family will like it? 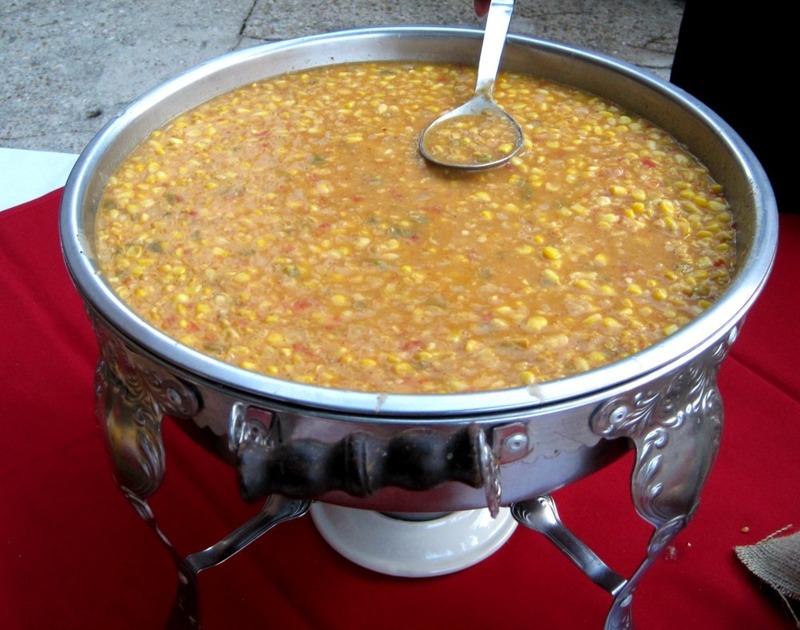 I also had a heaping plate of the Corn Maque Choux. It kind of reminded me of cream of corn. It was so yummy!!! I loved the food servers at the event. They were so nice and so forgiving, when all of us bloggers would ask if we can take pictures of the food! However, I have to say this weekend was the first time that I felt really welcomed as a food blogger. I tell people I am a food blogger and they just give me that kind of weird look. 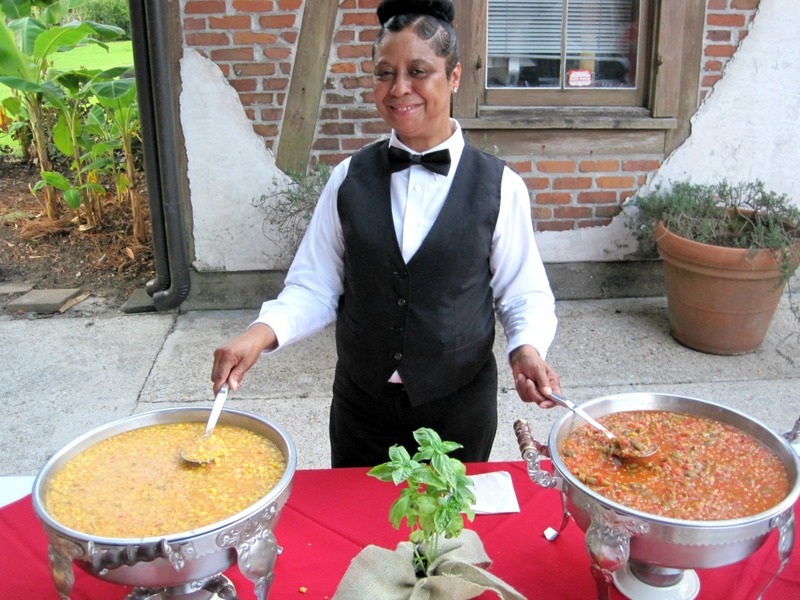 But at White Oak Plantation, when they were giving announcements and speeches, they welcomed the food bloggers. I felt really proud at the moment. Next on the menu was one of my favorite things which was the sweet potato souffle. It was soooooo good! I wanted to go back and get more, but I didn’t, because one I was too lazy to move and second I was holding off for dessert! Last but not least for the dinner was the Porchetta, which was the hog flings. The meat was tender and delicious and had a wonderful smoked flavor to it. Ready to see my dinner plate? I didn’t eat everything, but I ate most of it. It was just a beautiful assortment of southern dishes and I just had to try everything! I hope your not judging me on my dinner plate. It was sooooo good!! I’ll let you judge me after you see what I had for dessert! The dessert was white chocolate bread pudding with whisky sauce. I didn’t have intentions of having dessert, well ok I did, but I only went to get a cup of decafe when a lady whispered, hey come here! It was one of the server ladies and she gave me a HUGE, last piece of white chocolate bread pudding with the sauce dripping all over it. When everyone at my table saw it they all got up to get some and yes they had the bread pudding, but not that sauce over the top. I was a lucky one!! It was incredible. One thing I noticed on my trip is that I didn’t see a lot of bread on menus unless it’s corn bread or bread pudding, which is probably a good thing for me. 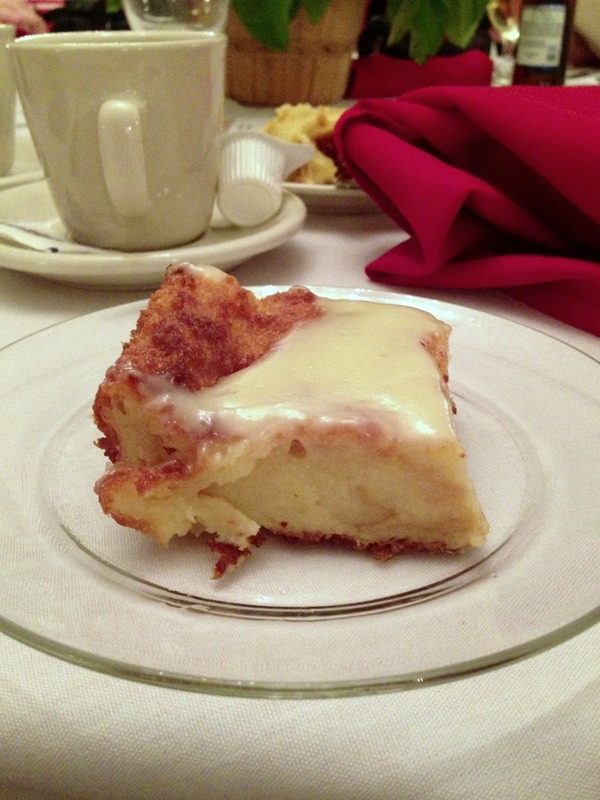 However I have had bread pudding before, but nothing compares to the bread pudding I had in Baton Rouge. Now these people can make a mean bread pudding that is so moist, so sweet and so out of this world. I think I gained 5lbs. just thinking of it!! Here is the White Oak Plantation in the evening, just before we left had to take a picture because it was just so beautiful. Since I was so inspired by the Southern dishes that I tried, I thought I would re-make one of my favorites which is my Jambalaya, served with Corn Bread. I originally made this recipe back in January 2012 but the pictures were just horrible!!! You can see them here if you like. So I thought this would be the perfect opportunity to re-make my recipe and serve it with a brand new recipe, which is my cornbread. 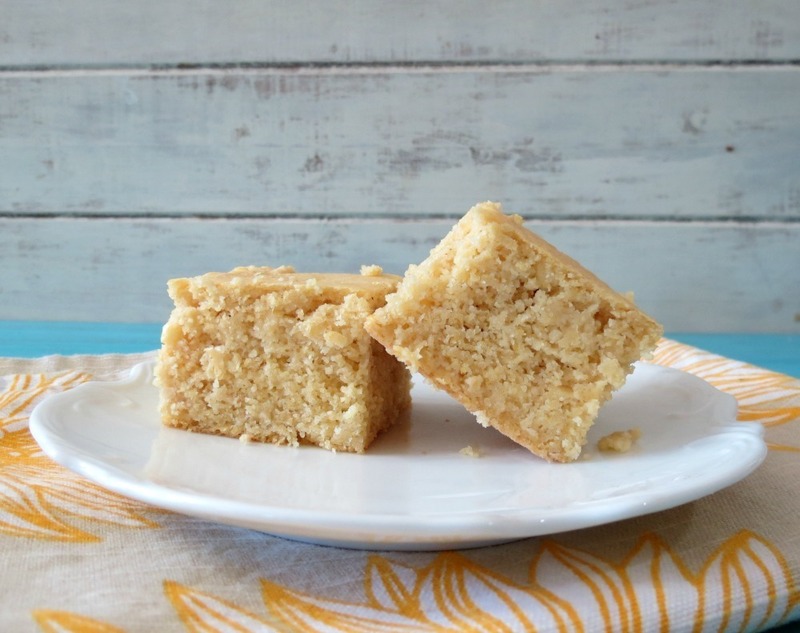 The cornbread is moist, light and a little crumbly, just like corn bread should be. I did at powdered sugar to the mix, but it’s not a sweet corn cornbread. I save the sweetness for adding a drizzle of honey over the top. I don’t know if you know this but cornbread isn’t suppose to be sweet, it’s a bread to go with a dinner, so I stuck with the traditional and I am very happy with the outcome. The Jambalaya tastes amazing! It’s thick, hearty, chunky and perfect for a chilly evening. It will warm and will fill your belly. This recipe is actually one of my family favorites and I get rave reviews from people who have tried this recipe. 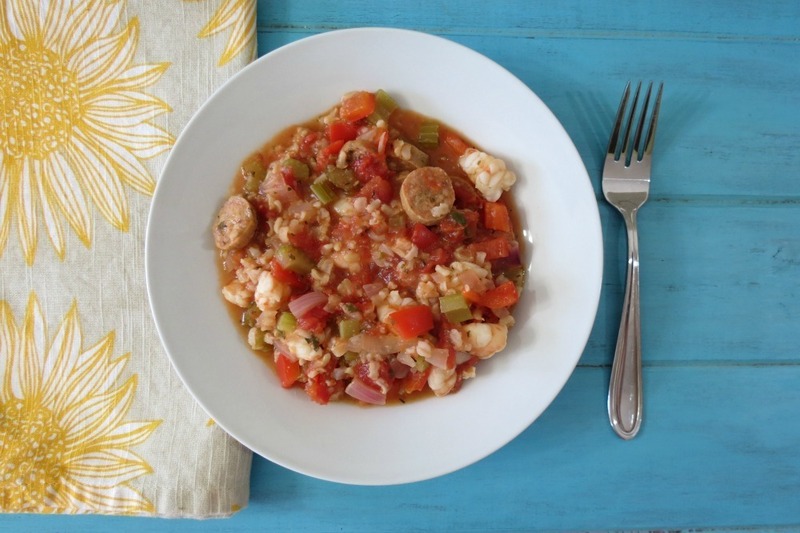 The Jambalaya is made with chicken sausage, shrimp, lots of vegetables and rice. I wasn’t kidding when I said it is hearty. This is a wonderful stew that isn’t overly spicy. However, for me, I add more hot sauce in it when I serve myself a heaping bowl of it. My Husband on the other hand doesn’t care for so much spice, so I made this recipe the way I know he would like. 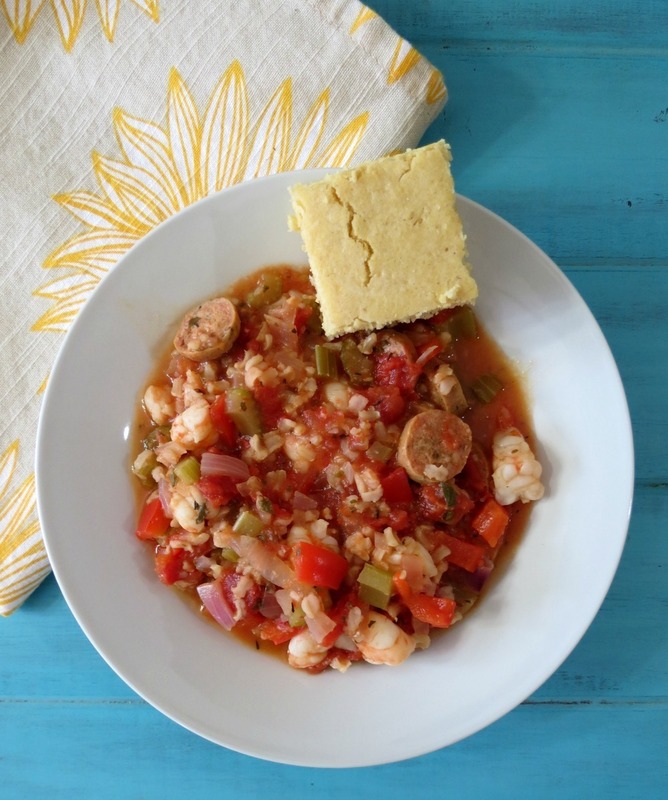 A thick hearty healthy stew made with chicken sausage, shrimp and vegetables served with a moist, light, low calorie corn bread. Reduce heat to medium low. Cover and simmer until veggies are tender and rice is fluffy, about 35 minutes. Add shrimp and re-cover. 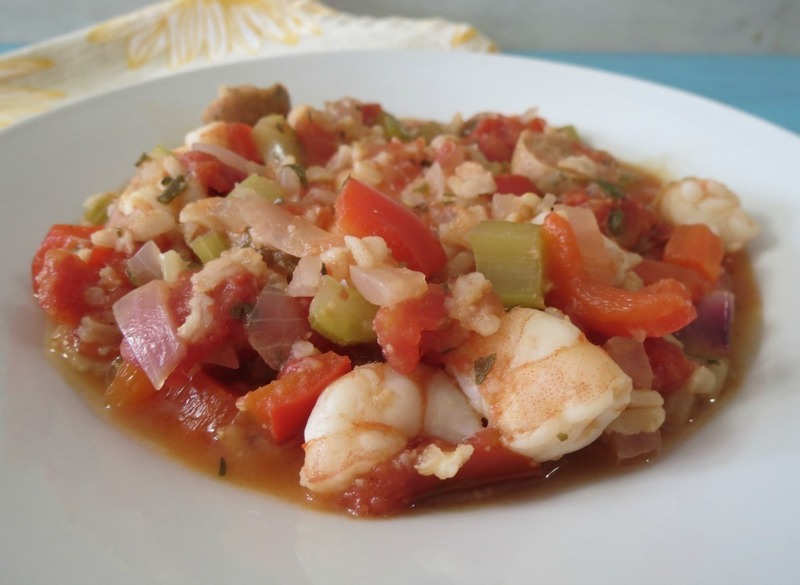 Continue to cook until shrimp are tender and cooked through, about 6 minutes. If you like, season to taste with salt, black pepper, and additional hot sauce. When you set the Jambalaya to cook, that is when I started the cornbread. They were done at the same time. Spray an 8 x 8 brownie pan with cooking spray; set a side. In a medium bowl, add cornmeal, flour, sugar, baking powder and salt; set aside. In a blender, add coconut milk, melted butter, egg and corn, blend until corn is broken sown and mixture is smooth; about 30 seconds. Add coconut mixture to flour mixture and mix until combined. Do not over mix. Pour batter into prepared baking dish and bake for 15 - 20 minutes or until toothpick inserted int the center comes out clean. Cut into 16 slices. That’s it for me today! This was one long post! But I just have to so much to share with you! Time for me to go eat my dinner which happens to be today’s recipe. I am starving!! Omg !!! Thank u for sharing and enjoying my city. Lol… Louisiana is great place to live. Sounds like you got a real taste of the south!! I’ve always wanted to try jambalaya and you make it look so good! 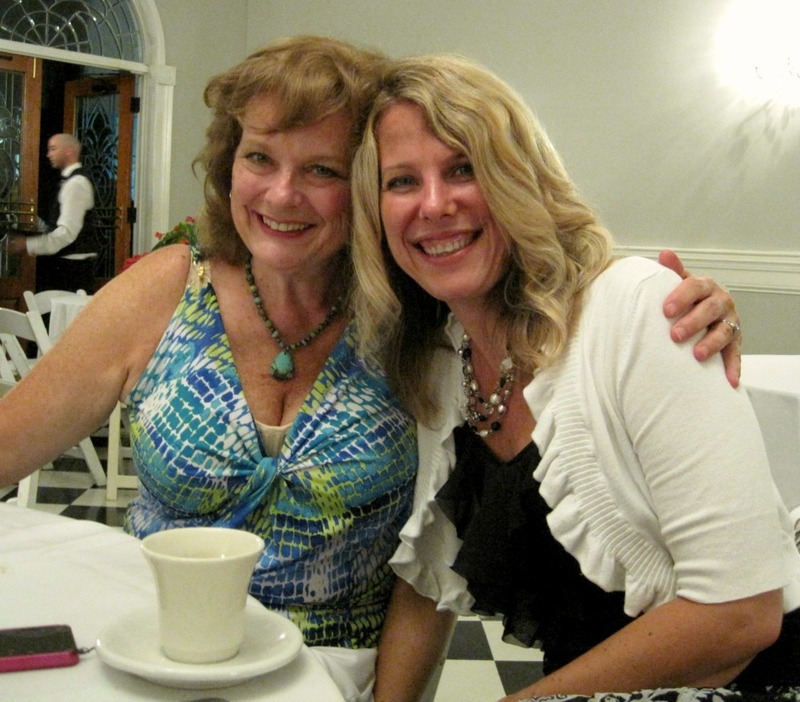 Had a great time with you and you Mom! 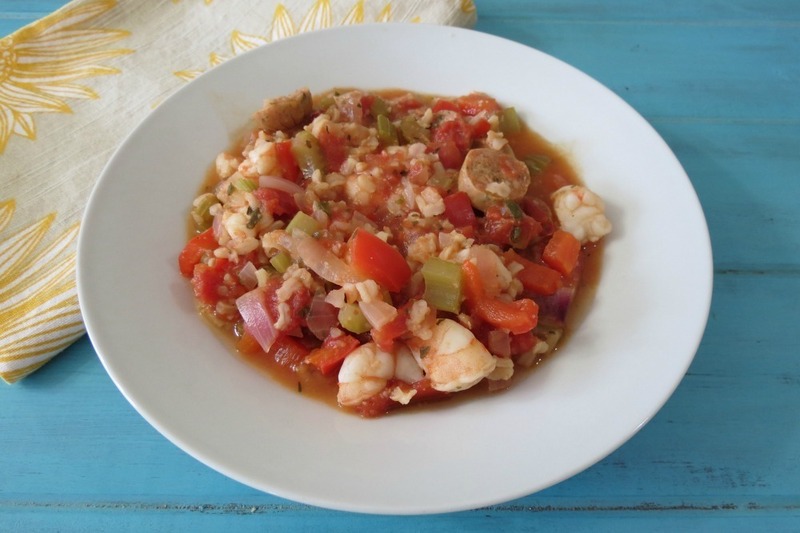 Your Jambalaya looks delicious! I am so happy that I met you!!! I have been a follower of your blog since Emeril’s Serious Sandwich!! I think I need to get my tush to the south! I can’t believe how fun the South is! I would never have guessed it!! You should go!! What a fun and interesting trip you had Jennifer. The food and the plantation look so amazing and I love that you were so inspired by your trip. You brought New Orleans back home with you, how fun is that? 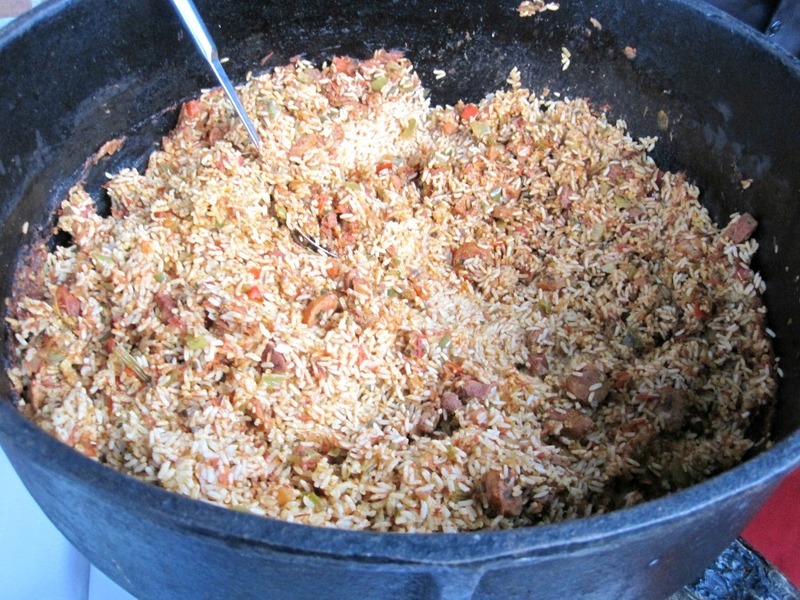 Love your Jambalaya, it looks wonderful! Thank you Chris! I really did love it there! I loved all the food, too! Isn’t okra amazing? I could eat it every day! As well as boudin! 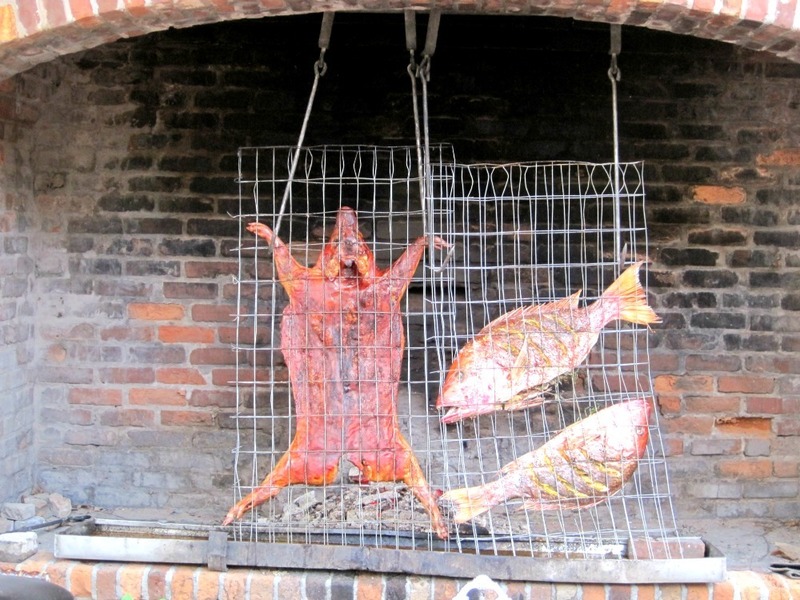 You’ll have to try Red Snapper again! It’s one of my faves if it is done right! I want to make that white chocolate bread pudding sometime! I’ll have to give the snapper another try for sure! !